Feels like I haven't made a post in like forever, so i decided to show you my everyday makeup. To be fair it changes some days depending where I'm going or what I'm doing, but this is the main stuff I would say. 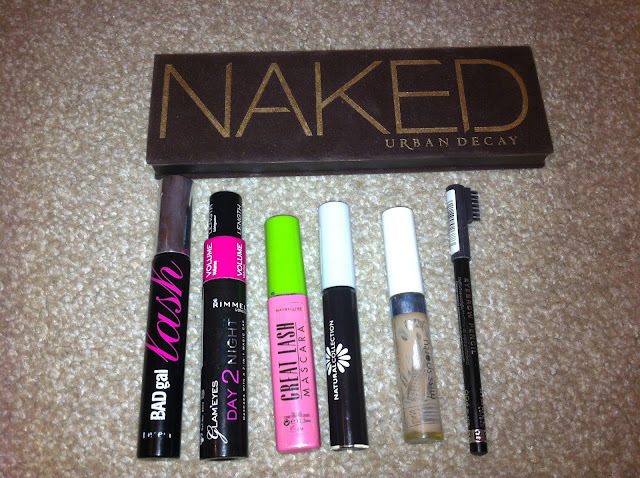 I would say that this is my everyday makeup for my eyes(although i don't wear all 3 mascaras at once). I used to be obsessed with the maybelline great lash mascara but i would now only use it if i wanted a more subtle look as i much prefer the rimmel day 2 night one as it gives such great volume and length! The badgal mascara is good but for the price not the best I have to say. I don't that often wear eyeliner but if I feel like a winged eye i would use the Natural collection liquid eyeliner normally. Not the best liquid eyeliner in the world but pretty much does the job. Please excuse the disgustingness of the clear mascara, which isn't particularly clear anymore! I've had this since like year 7 not even joking, but now i just use it for my eyebrows along with the rimmel eyebrow pencil. Finally the beloved naked palette. I adore this palette(Review coming soon!). I don't wear eyeshadow everyday, but if I do these are basically the only eyeshadows I use. This is my everyday makeup for my face. I switch between my bourjois healthy mix serum and Rimmel wake me up foundation(Review coming soon!). I love both of these foundations so I just wear which ever one i feel like wearing that day to be honest. My rimmel one is probably slightly darker so i tend to wear that if i've either tanned/want more colour on my face. I also use the benefit erase paste for concealer which my mam gave me as she didn't like it. It is a very thick consistency but gives really good coverage so I tend to use that as an under eye concealer. I also use benefit hight beam which also used to belong to my mam for a slight highlight. My two favourite blushes, and the two I switch between everyday are the benefit coralista and MAC lady blush. I would say i wear coralista a tad more as i just prefer a powder blush to a cream blush. Finally the 'chocolate brozer' which everyone raves about. Mines in the shade 52(I didn't even realise there was different shades, I just picked one up) but it seems to be a good colour. Finally lips. I don't tend to wear something on my lips everyday but when i do it's most definitely Hue by MAC, and, or on top, MAC cremesheen in Just Superb. Love both of these so much. Such a pretty pink colour without looking too over the top. As i've said in this post I have a few reviews on the way, so watch out for them!